Today I have spoken with Federal Agent Tony Gaylard, who has been handling my complaint about the AFP not reporting Overseas Scammers to Interpol or to their Home Authorities. I learnt Sirs, that the AFP also do not charge or arrest Australian Citizens who go overseas and scam their fellow Citizens then fly back to Australia. I also learnt Sirs, that the same is true of our State Police, they also will not charge or arrest a Victorian who goes overseas, scams his fellows then returns Home. In fact, the State Police, also do not report these Scammers to Interpol or to their Home Authorities either. This is why the Scammers say, "You will find that your Authorities will do NOTHING!" and Sir, their numbers have now grown to many thousands, gutting tens of thousands of Australian Citizens each year and our Authorities won't report them to anybody or arrest them when they come back to or enter Australia. Authorities, because, by their definition of the crime, it's not a crime in their jurisdiction, so they do NOTHING!!! The AFP and Victoria Police both say that this failure to report anybody or prosecute anyone involved in the gutting of tens of thousands of Australians, can only be changed by changing the Law. I have been told Sirs, that this can only be done by the Parliament. Sirs, can you bring these matters to the attention of the Parliament? 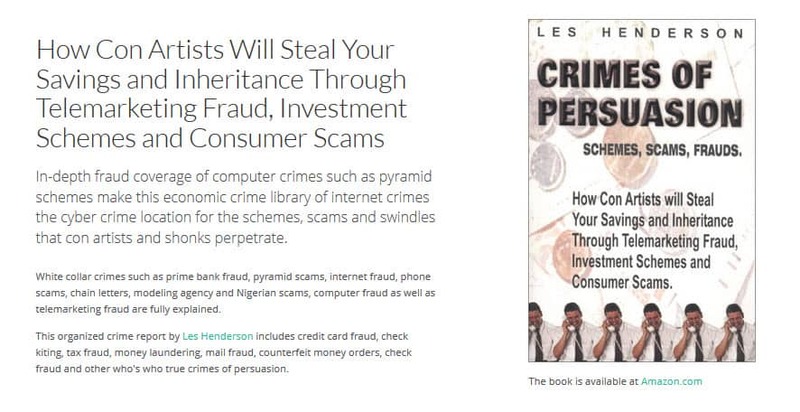 These scams have been growing since 1998 and it has gone on far, far, far too long! I found it outrageous back in 2001 that we were doing absolutely NOTHING about overseas scammers and I am very disappointed and disgusted in our Authorities for allowing this "open slather" on our citizens to continue to grow unchecked since. I have been bringing these matters forward myself, when these matters should have been addressed by the State and Federal Police and our other Authorities such as ASIC and the ACCC when they first became aware of our citizens being gutted in their thousands. I find it abhorrent that scammers can gut tens of thousands of our people and that we do absolutely NOTHING to prosecute or report the wrongdoers. Am I the only person in Australia who gives a "Damn" about the tens of thousands of gutted victims??? I ask that you change our Law so that our Authorities will report scammers to Interpol and to their respective Home Authorities and that these scammers should be arrested, stripped of their assets and locked away for a long time, if they should ever happen to set foot in Australia! One of us is now being scammed every five minutes of the business day, and over $1 Billion is being taken from tens of thousands of us every year. I ask that you change the Law, Sirs, quickly!!! With regard to reporting agencies within Australia, none of the Police - State or Federal even make out a report because it's not a crime under their Act. ASIC will take a report but they don't pass anything to Interpol or to the Home Authorities of the offenders. They will write a letter to the Company and they will report them to their counterparts in some of the countries where these scammers operate from, but that seems to be about it. An Australian citizen can scam away to his hearts content, so long as he is outside of Australia when he does it. Then it's not a crime and he will not be prosecuted or charged when he comes home! Scammers from other countries can scam away and then enter Australia and they will not be charged or prosecuted because they have not committed a crime under our Police Acts. ASIC occasionally arrests somebody, but it's really not methodical or organised prosecution of these scammers. The only way our Police will start recording and reporting these crimes and prosecuting the offenders is if their Acts are changed. Doesn't say much for our Police that they themselves have done NOTHING and just ignored the tenfold increase and tens of thousands of gutted victims. If these were banks getting robbed every five minutes it would be a different story!